Mother’s Day, and the 364 other days in the year, make perfect opportunities for showing caring, hardworking mothers everywhere that they deserve a little something just to say thank you. So whether it’s her birthday, anniversary or just because, say it with a sign! 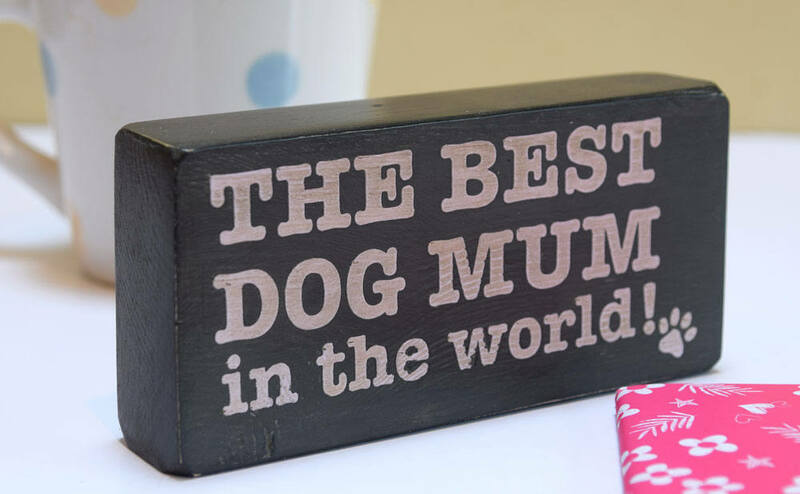 Makes an ideal Christmas gift for that dog-loving mum of yours, too! This handmade, chunky, shabby chic wooden block dog sign, plaque makes a great gift for any dog lover, or why not treat yourself? Use it as a paperweight, a bookend or just sit it on a shelf and bring some humour into your hectic life. Colours may vary due to different monitor set ups. This sign has a Plymouth Rock grey background and lilac lettering. Also available with a Milky White background and lilac lettering.